Sometimes pictures speak louder than words. It was not that long ago that you could walk into a “cellphone” store and find some hundred varieties of phones that all looked completely different. Flip phones, slide out phones, long keyboards, no keyboards and so on. Apple has already disrupted the computer industry, the music industry, mobile industry and perhaps soon the TV industry, but in doing so, they have also become a leader in design. Mobile phone designs are becoming homogeneous because every phone needs to be able to accomodate whatever features Apple popularized on their own phones and tablets (touchscreen, sliding gestures, on screen keyboards, web browsing etc). See for yourself. Check out these images circulating around the internet. What is your opinion? Is it legitimate to say Apple is the leading designer in these categories? I guess design is a very obscure thing. I guess you can’t says that one is copying apple’s design, because design like art is often an inspiration of life. Only good things get copied, so all i can say is probably apple got a great design that is why it is being copied. To call Apple a revolutionary in the cellular and tablet market would be a big understatement. They have totally changed the market (as is evident by the images in the post above) – be it cellphones, tablets, or laptops. The new ‘Ultrabooks’ product line is a classic example, and no none can disagree that these ultrabooks have been modeled to look like Macbook Airs, which have been around for a while now. And let’s not forget that the iPod’s were a sensation in the music-player market a decade or so back. Steve and his team have already conquered and completely changed the face of the smartphone and tablet market, thanks to the iPhone and the iPad. And now, the next stop for Apple is the TV industry. Totally agree with the viewpoints above. Apple, for all its faults and fanboys, has been a game-changer especially as far as design and looks are concerned. I still remember people (including me) ooh-ing and aahh-ing in 2007 when the 1st-gen iPhone was released. 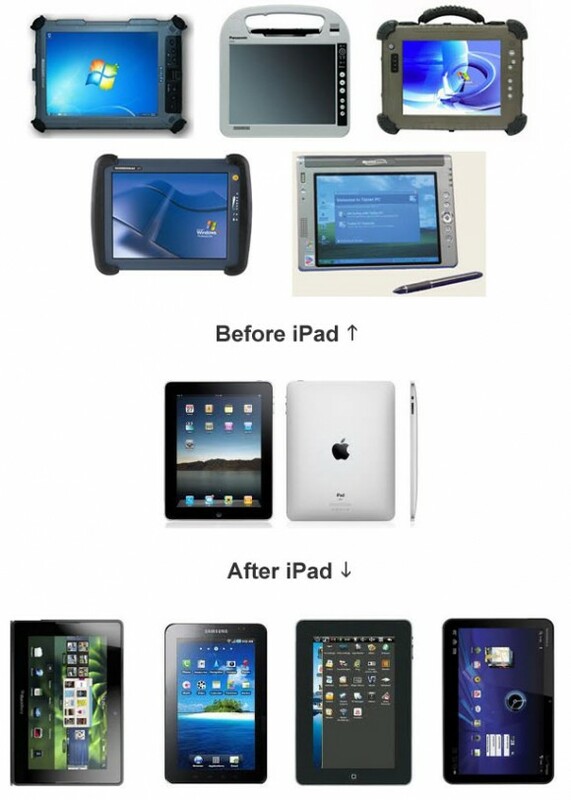 Companies might not (and will not) openly admit this, but everyone’s copied Apple designs in one way or the other.